Makes about 100 skewers, depending on how thick you cut your chicken. This recipe was inspired by Saveur magazine, although made quite a few substitutions due to the fact I was drinking a Caged Alpha Monkey beer while I was cooking. Watch out for that stuff. In the food processor: process oil, sugar, salt, garlic, lemongrass, ginger and red curry paste until it is a paste. Cut chicken breasts into strips: about 1/3 inch thick, about an inch wide and about three inches long. As you cut them, lay them on a cutting board, cover them with a sheet of plastic wrap, and gently bounce a hammer up and down on them until they are slightly flattened. Toss them into a big bowl. When all the chicken is cut and pounded, combine chicken strips with the paste. 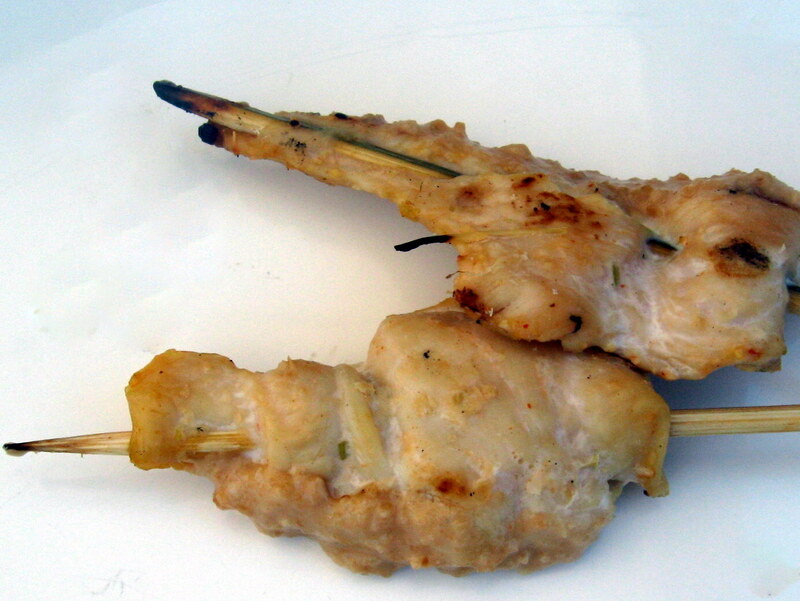 Then thread the chicken onto the end of a bamboo skewer, knitting the skewer through the chicken. This process takes a little bit of time, hence the beer. In a food processor: process peanuts until finely ground. Add brown sugar, garlic, Sriracha and cider vinegar. Process until very finely ground. Transfer to a small pot and add coconut milk. Cook, stirring, until consistency of pea soup. Adjust seasoning to your taste. I also like this sauce on beef, pasta, rice and potatoes. Yum!